Now, you do feel quite badass when you finish a run in the driving rain, or a blizzard, or in the pitch dark. But let's be honest, I don't find it fun to run in the dark or with ice pellets hitting my eyes. I do like running in the rain....but I'm a little picky about what kind of rain. A cold, bone chilling rain? No thank you. 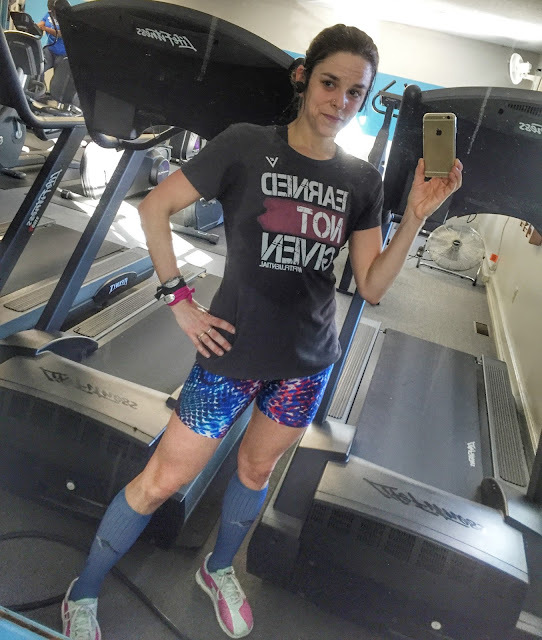 On the treadmill, you get to stay warm and dry (except for the sweat) and get in a quality workout! Bring what you need. The benefit to the treadmill is that you have a place to put your stuff so you have it at hand when you need it and do not have to carry it. 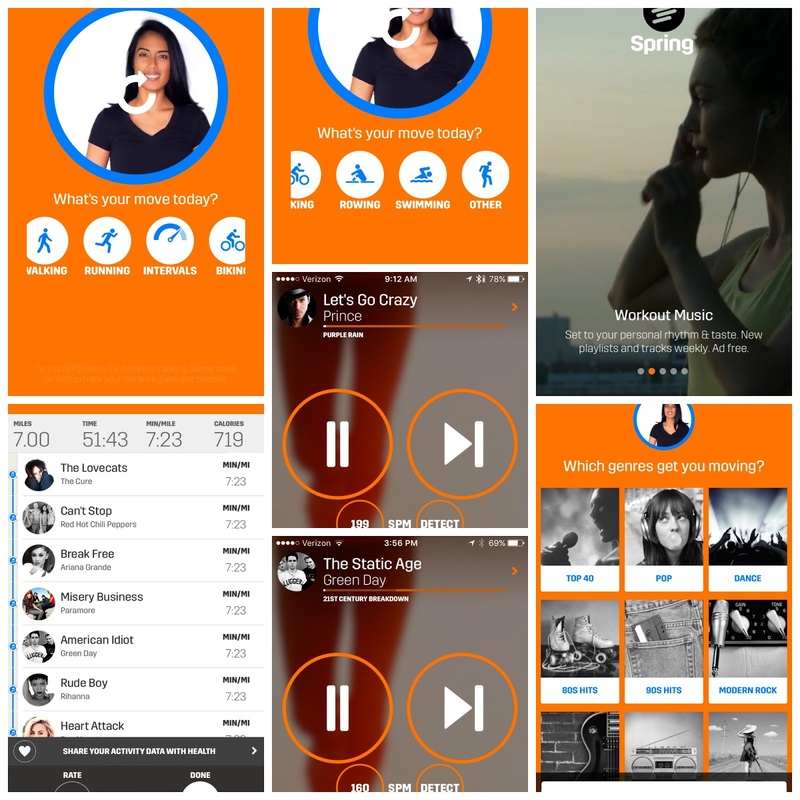 Have your SOS Rehydrate in your water bottle, towel for the sweat, and favorite ear buds. 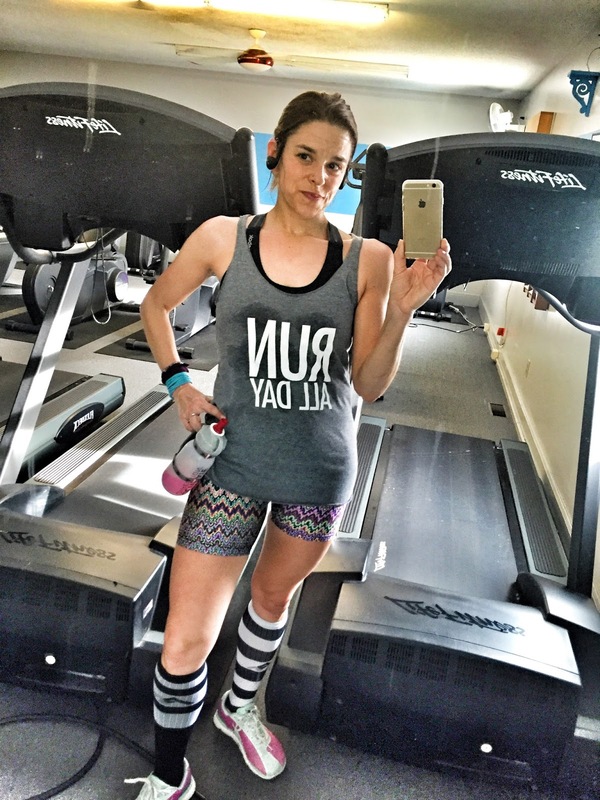 My iPhone has been key in getting me through lots of running on the treadmill. I have since switched to wireless earbuds (because I kept yanking the cord of my Yurbuds and my phone would go flying). My friend Seth turned me to Mpow wireless earbuds. Mine are bit different than his, but I am loving mine! I used to always run with music. But I've gotten a bit more aware of the dangers of running when you cannot hear what's going on around you. When I run outside, I usually do not listen to music. Unless I'm in a race. But when I'm on the treadmill, I like my music loud. I don't like to listen to my race playlist too much though - because I don't want to be tired of my playlist before the race. There is a great app call Spring. I've only used it on the treadmill so far, but I love how you can choose the steps per minute and music genres. You can also skip past some songs you aren't in love with, however, you only allowed to skip past 5 songs. Which I've only done once. Most of the time I have loved the music played on the app. When music isn't cutting it, I have a couple of favorite apps on my phone. My DirectTv app and HBOtoGo apps. I love to watch a great cheesy 80's or 90's movie without interruptions. Movies have gotten me through many, many runs. When I trained for Mt. Washington Road Race, my best workouts were on the treadmill. 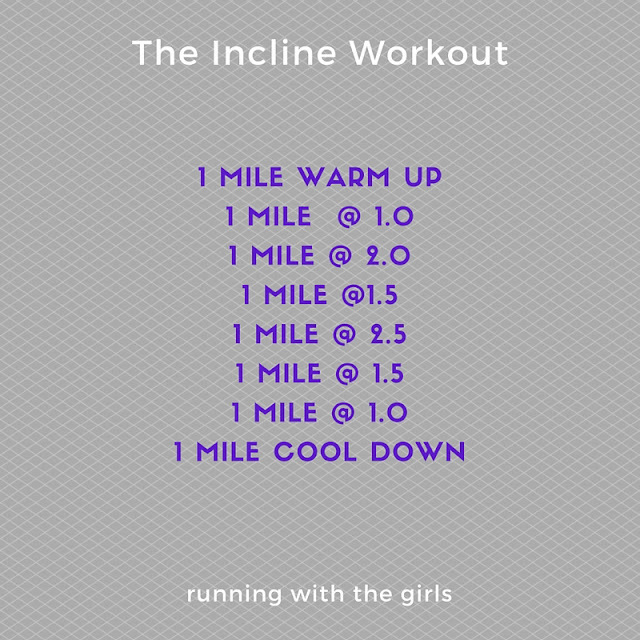 I'm not training for that race (yet), but I'm still turning on the incline! 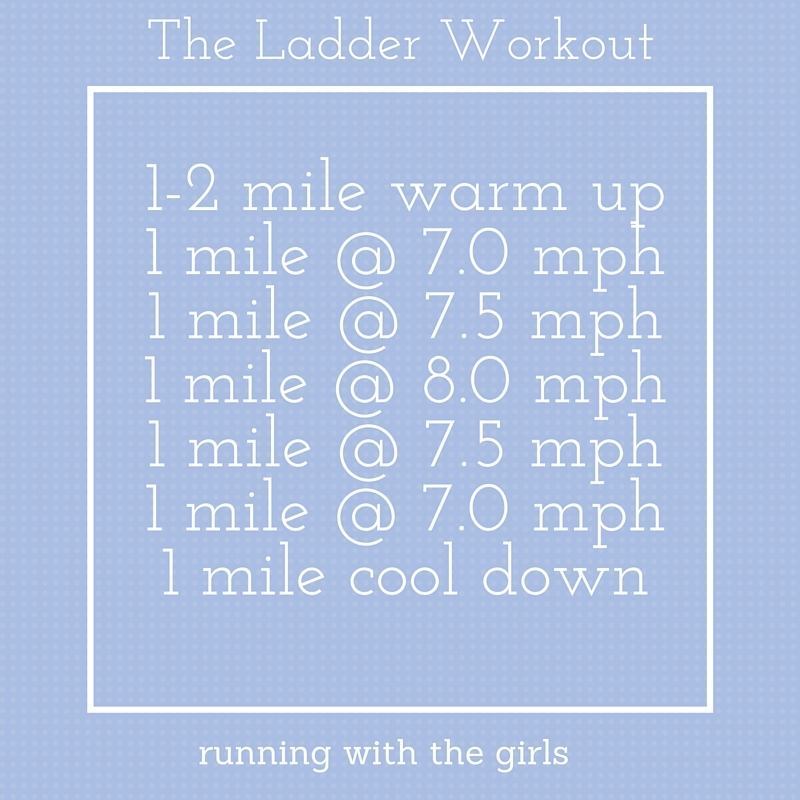 The pace varies with this workout. 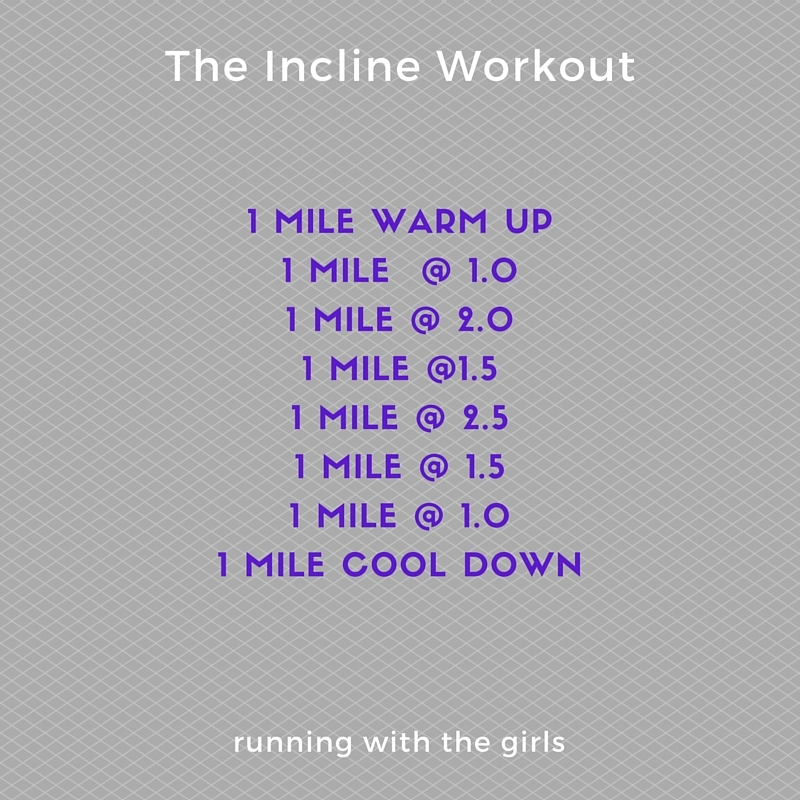 If I'm training for a 5k or 10k, I increase the pace of this workout closer to a 10k pace. 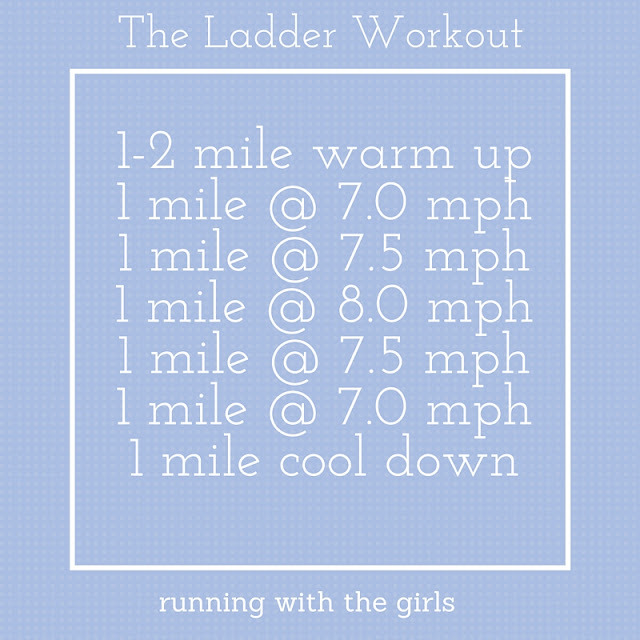 For the most part, I keep this workout at my marathon goal pace (which is 7.0 speed/ 8:34 pace). This workout can be any distance you want it to be. Just make the adjustments. It's a favorite of mine for sure. I have found that it's best to do an odd number of miles to make a "perfect" ladder. But even numbers work as well. You just have to be flexible with it. Depending on my goals and distance, I may up the pace or make the pace increases smaller. But you get the idea. Start off at a comfortable pace and increase it. Get to a plateau, then work yourself backwards! It's easy to modify to meet you needs. Now. 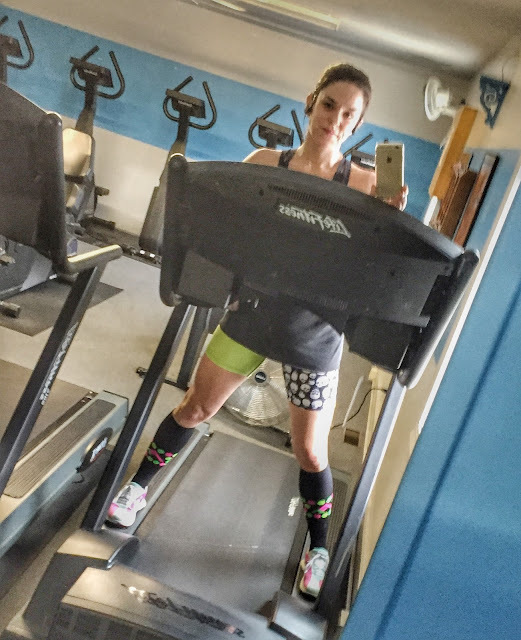 What are your tricks of the trade for treadmill running? What workouts do you enjoy most?